HENDERSON, Nev. – The Henderson Chamber of Commerce recently presented Nevada State College with a check for $4,975 – proceeds from the 23rd Annual Swing for Success Golf Tournament, which took place in April. 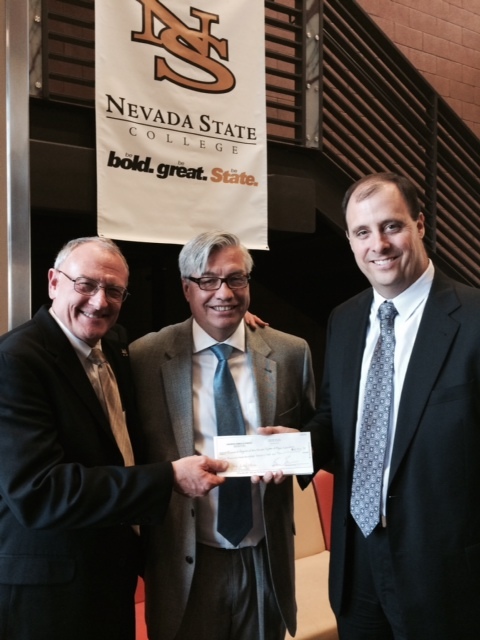 Private donations are important to Nevada State College, which centers on access, affordability and instruction. Private donations such as this are used to supplement materials in classrooms, labs and libraries as well as scholarships. The newest institution of higher learning in the state, Nevada State College is a comprehensive college with a commitment to educating students for success in the real world. Since its establishment in 2002, NSC’s student body has grown to encompass more than 3,000 students representing a broad array of cultural and economic backgrounds, and its 2,000-plus alumni are living and working in every corner of the state and beyond. Nevada State College’s main campus is located in Henderson, Nevada, just 15 miles from the world-famous Las Vegas Strip. The college also has a satellite campus in downtown Henderson. For more information on Nevada State College, visit nsc.nevada.edu. For more information regarding the golf tournament, or the Henderson Chamber of Commerce’s other philanthropic efforts, call the Henderson Chamber of Commerce at 702-565-8951 or visit hendersonchamber.com.